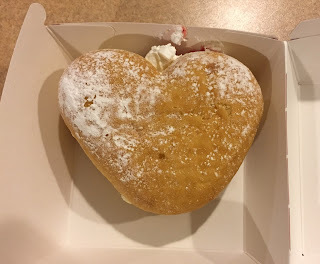 When I was in Montreal for La Poutine Week, I visited Tim Hortons to look for something new to try, and I got Beigne Shortcake Aux Fraises and Scone Aux Framboises Et Chocolat Blanc. When I was wiping off the cream from my hand and scone, another staff came to me and asked what had happened, so I explained the situation and she gave me a new donut put in a box properly. Seeing this box, I realized I actually had this donut before but it's not heart shape. 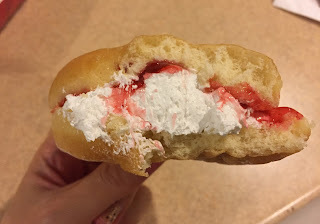 The sugar-powdered donut was soft and fluffy, and there's a lot of airy whipped cream and sugary-sweet strawberry jam. Same as the last time, every time I bit, the fillings came and out and were slippery so that it's a bit hard to eat.